There's no substitute for talent, and there sure is none for experience. The seasoned Saint Louis Crusaders overcame the foul problems of Scott Smith to overpower Campbell 50-30 last night in the opening round of the Hawaiian Airlines/HHSAA Boys Basketball Division I State Championships. A polite crowd in Jim Alegre Gymnasium at Radford High School saw Saint Louis control the Sabers from the opening tip. Smith led the way with 18 points, eight rebounds and three steals. Solomona Aigamaua, who also dominated on the block, had 15 points and six rebounds. "It's not real good," Aigamaua said of his teammate's foul troubles. "We need everyone to contribute. That was a good team effort. Campbell is a good team and came out with a great effort." Cole Shidaki added 10 points and six boards. The Crusaders, a veteran squad, vividly remember last year's stunning loss to Campbell at the state tourney. "We knew Campbell is real capable," coach Delbert Tengan said. "We had a big lead on them last year, too, and they came back. Fortunately, Mona (Aigamaua) stepped up real big." Aigamaua shot 7-for-12 from the field, and Smith was 6-for-10 thanks to crisp ball movement by their teammates -- no surprise for a unit that has played four games in the past six nights, including a big win at Konawaena over the weekend. 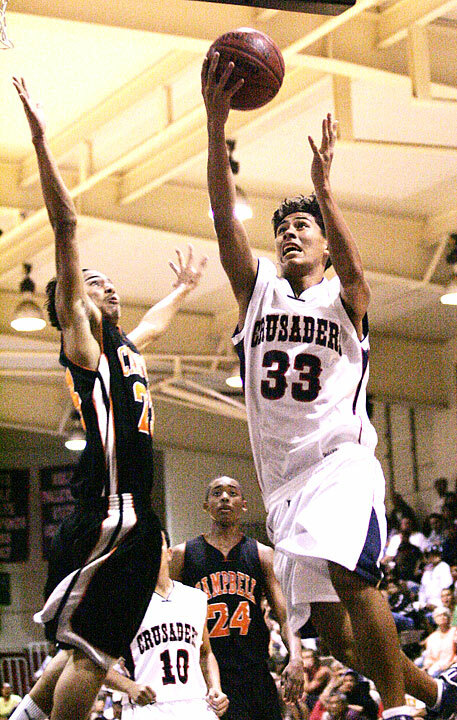 Saint Louis (22-5), the third-place team from the Interscholastic League of Honolulu, will play Kaimuki tonight at Alegre Gym. Tip-off is set for 8 p.m.
Rashaad Battle paced Campbell with eight points, six rebounds and three blocked shots. Campbell (17-13) will play tomorrow at 12:30 p.m., against Baldwin loser at the Stan Sheriff Center. "Today was an off day for us, and we weren't getting calls," said Jayden Delizo, one of just three seniors on the Sabers' roster. "We weren't clicking. Saint Louis is good, but I think we could've played way better." Delizo, one of the team's top scorers, finished with just three points. "We're not used to playing without Mike (Makinano). We tried to do what we could." Makinano was cut from the team prior to the tournament for disciplinary reasons. Smith, a 6-foot-7 senior, has been prone to foul in recent games. He amassed nine points, five rebounds and two steals in the first quarter to dominate the low post. Saint Louis, which scored the first 11 points of the game, led 15-2 entering the second quarter. By halftime, Smith had 15 points despite sitting out most of the second quarter. Campbell struggled equally against the Crusaders' man-to-man and 2-3 zone defenses. The Sabers shot just 17 percent from the field (3-for-18) in the first half. Open shots over the zone didn't help Campbell, which was 1-for-10 from the 3-point arc. "We were cold. We didn't mind the (Saint Louis) zone, but we just didn't reverse the ball enough," Campbell coach Bobby Samson said of the first half. CAMPBELL--Danny Mau 0, Jay Nahial 0, Michael McDonald 0, Jayden Delizo 3, Patrick Ward 6, Walter Daniels 6, Joseph Atimua 6, Terence Tafai 1, Pita Feleunga 0, Rashaad Battle 8, Zachary Manuel 0. SAINT LOUIS--Ricksson Pacarro 0, Kuli'a Aiona 0, John Quindara 0, Lucas Gonsalves 1, Scott Smith 18, Corey Lau 0, Siunipa Fiefia 0, Kyle Gonzaga 0, Cole Shidaki 10, Solomona Aigamaua 15, Geordon Hanohano 0, Michael Tuiloma 4, Micah McClinton 2, Jamison Miller 0. 3-point goals -- Campbell 4 (Atimua 2, Delizo, Ward), Saint Louis 1 (Shidaki). 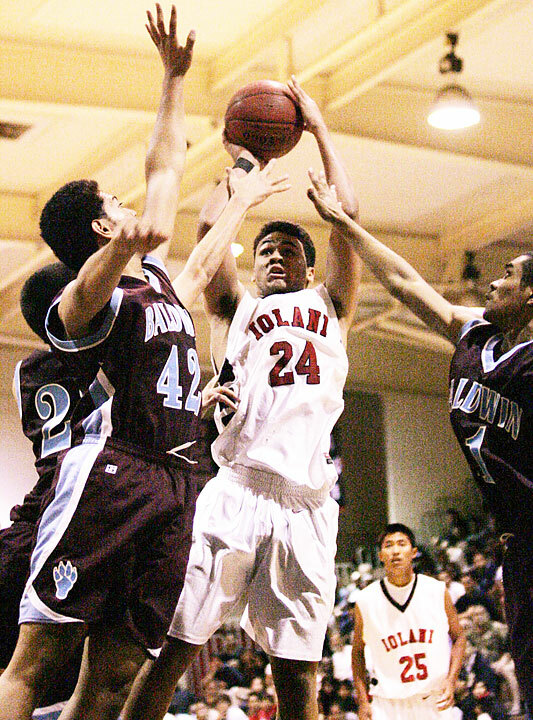 For 7 minutes, it was a run-and-gun battle, but the Raiders dominated the second quarter and prevailed easily over the Maui Interscholastic League runner-up Bears. Case Miyahira scored 18 points and Ryan Dung added 12 as Iolani (21-7) advanced to the quarterfinal round. The senior guards combined for five treys in the first half, but their scoring wasn't as big a factor as Iolani's swarming pressure defense and hustle. "That transition game was killing us," Dung said of Baldwin. "The big men weren't getting back on defense," Miyahira added. Coach Mark Mugiishi and his staff got their bigs to hustle back more quickly, and that changed Baldwin's fortunes. John Salmo scored 18 points, but 14 came in the final quarter when the game was out of reach. Jordan Helle grabbed a team-high eight rebounds. Chase Nakamura scored just four points and played just 14 minutes due to foul trouble. Baldwin, which shot 80 percent from the field in the first quarter, finished with 22 turnovers. "They turned up the pressure and we kind of lost our poise," Bears coach Wayne Gushiken said. "We couldn't get out of the traps, we weren't moving, and that hurt our offense." Ike Duru scored six early points, and consecutive buckets by reserve forward Kawika Grace gave Baldwin a 17-16 lead late in the first. It was the last lead of the game for the Bears. BALDWIN--Chase Nakamura 5, Jordan Helle 6, Ike Duru 6, Micah Shibano 2, John Salmo 18, Lincoln Seto 2, Michael Marrs 0, Kawika Grace 5, Ross Bisera 0, George Firmignac 0, John Cabael 0, Viliami Lavaka 1. IOLANI--Taylor Mounts 5, Pablo Warner 6, Kela Marciel 8, Ryan Dung 12, Case Miyahira 18, Andrew Skalman 0, Nick Christman 0, Liloa Nobriga 9, Lionel Fujioka 3, Berton Wong 5, Brandon Ball 0, Bricen McCartney 2, Troy Lee 0, Matt Smith 2. 3-point goals: Baldwin 4 (Salmo 4), Iolani 7 (Miyahira 4, Dung 2).